To fix. Simply downgrade the version of Ruby from 2.0 to 1.8. Both versions are installed. So it is as simple as changing a symbolic link. This is my second attempt at baguettes and this time they have turned out OK. The first attempt was really flat, spread out and just a bit wrong. 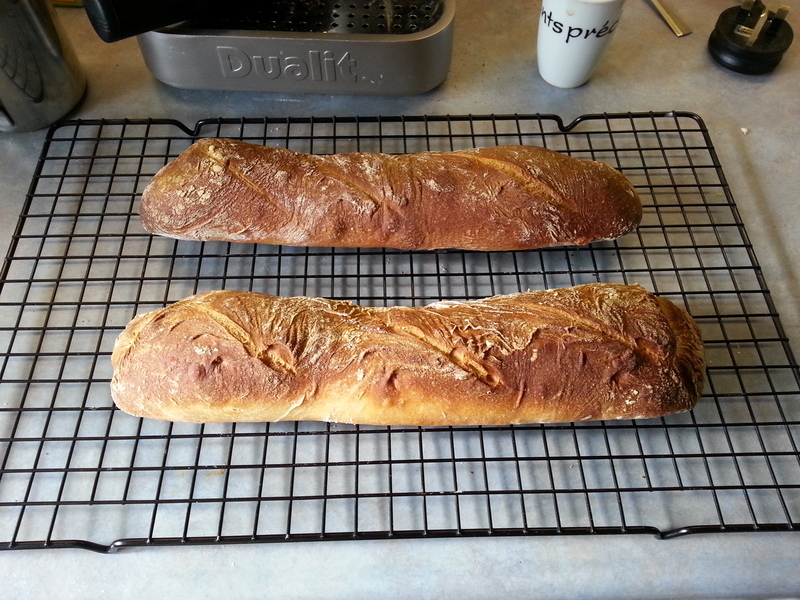 The recipe I have used is based on the Paul Hollywood Baguette recipe from the BBC but with some modifications. Firstly I don’t have a £400 mixer and so mixed with my hand mixer. For this I had to make the dough a little wetter. Secondly I don’t have a baguette tray. So, I folded some baking parchment to try and keep the shape of the bread while proving and baking. Place the flour, salt, olive oil and most of the yeast mix in a mixing bowl. Start mixing on a slow speed, gradually adding the rest of the water until you have a smooth dough. This should take about five minutes. Tip the dough into an oiled bowl, cover and leave the dough to prove for two hours. Tip the dough out onto an oiled surface. Dust your hands in a little flour and divide the dough in two. Knock back the dough and stretch and fold, and then roll the dough into a baguette shape. Place on carefully folded parchment paper to keep the baguette shape, cover and leave to prove for 30 minutes. Heat a roasting dish in the bottom of the oven and pour in some water to create some steam (this will help form the crust). Preheat the oven to 220C/425F/Gas 7 in a non-fan oven. Just before baking, slash the top of each baguette three times. Bake the baguettes for 20 minutes. Then drop the temperature to 200C/400G/Gas 6 and cook for 15 minutes. The baked baguettes should be golden-brown and have a slight sheen to them.